It is really a disaster that important data on your android device lost accidentally without any available backups. Don’t worry, the good news is that you still have the chance to undelete files on Android with a powerful third party Android recovery tool. You might be wondering which one is the best Android data recovery tool, read on this page, it will give you good reference and help you choose the best of the bunch. You must have to stop operating your phone totally, and you must even turn off the WiFi/Cellular Data connection and don’t run any app. Because when an app runs it will generate data in the phone internal memory, which may overwrite the lost data. Whether it supports your Android device and computer system (Windows/Mac)? How many file types it can recover? Is it safe and secure enough for scanning your phone? How about its success rate of recovery? Base on these factors and criteria, we pick up the best 5 Android recovery programs in the industry. 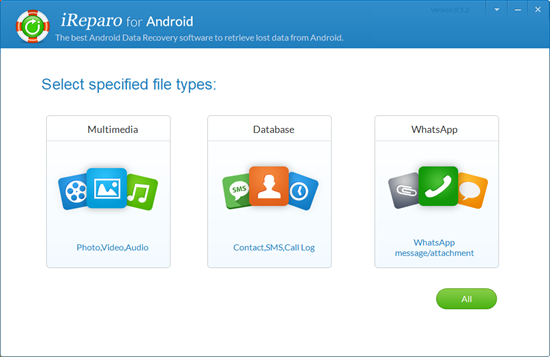 This Android Data Recovery is one of the highly acclaimed data recovery software for Android, which can be used to recover deleted/lost photos, call logs, contacts, text messages, whatsapp chats, videos, audio and etc from both Android smartphones and tablets. It is compatible with all versions of Android OS, including the latest android 8.0 Oreo. With it, you can preview and undelete files from any Android devices, like Samsung, Sony, LG, Huawei, HTC, etc. Dr.Fone for Android is another great data recovery software. 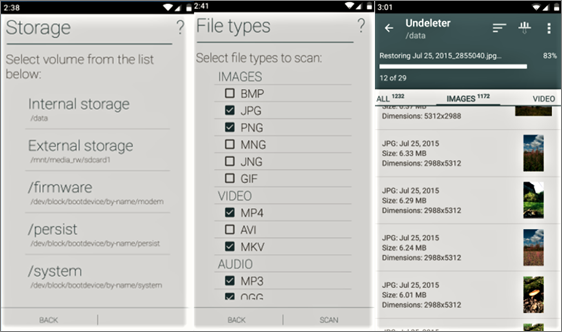 It can directly scan and restore deleted data on Android without backup. Both existing data and deleted data can be scanned and detected during scanning. Though the installation process is kind of troublesome and it takes a little longer to identify the device, Dr.Fone is still a great tool to thoroughly recover data from android devices. Recuva is the best free Android data recovery tool for external SD card. It can bring back lost files including pictures, musics, videos, documents, compressed, and emails with ease. 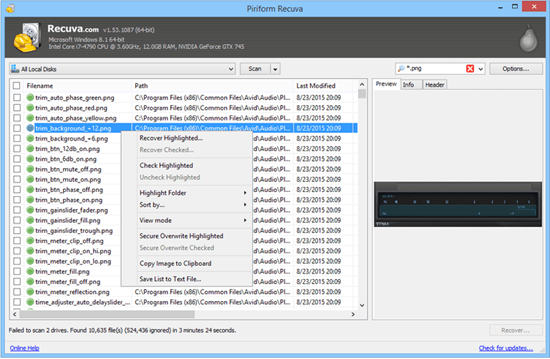 It might not be able to recover every file from every android device in every scenario, but it is definitely worth a try if you’ve got the problem that Recuva specializes in. After all, it is free. Undeleter for Root Users is a free android recovery app for temporarily restoring lost data like pictures, videos, music, archives, binaries, and all other files that were stored on your Android internal storage and memory card. All you need to do is to open the application and select the internal memory or SD card to scan. Then a list of the deleted files will be displayed. 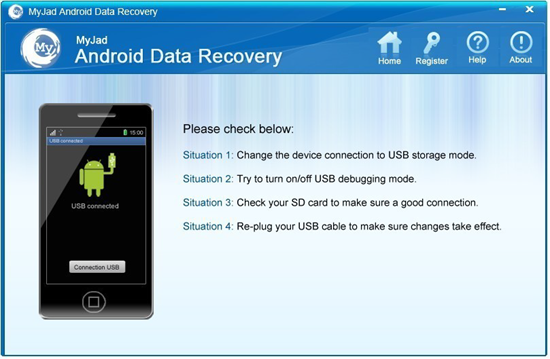 MyJad Android Data Recovery is also a recovery program like the others in the list, and it deals with the data loss of android devices without hassle. It help recover images, songs, videos, documents, archives, and more data stored on your SD card inside the Android phone. 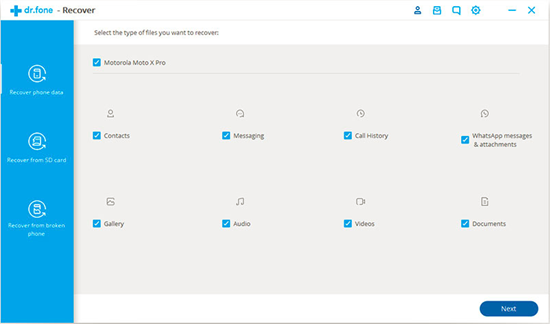 If you want to easily restore data on Android device, you should try the pro version. 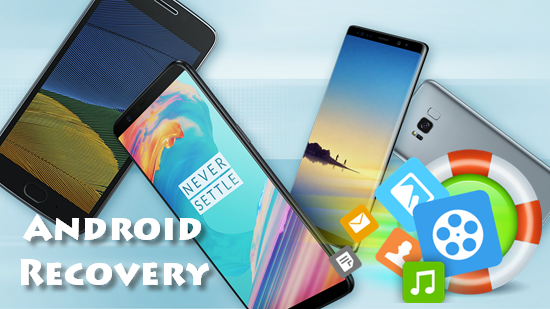 Of course there are many more Android recovery programs available, but we only listed those true best file recovery softwares that are able to undelete wide ranges of Android files. Hope that our recommendations can help you make a right decision. At last, one more major caveat here: When Android data loss happens, you should act fast and find an Android data recovery for help, and never try to use your phone until you get the lost files back successfully. Moreover, maybe you should root your Android first as some recovery tools require. If you still need help with Android recovery issue, please contact our support team via email support@jihosoft.com. And we are also happy to hear your thoughts in the comment section below.